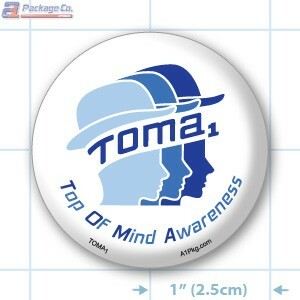 The Department Branding TOMA1 (Top Of Mind Awareess ) labels are custom printed labels that advertise your store name and logo on any product you sell. TOMA1 Labels by A1 Package Co. are of the HIGHEST QUALITY - its your image, it's our image, it has to be perfect! TOMA1 labels are a true circle, 2" (5.4cm) in diameter. Included in the price of this label is 1 HOUR of DESIGN TIME, PRINTING PLATES and FREE SHIPPING. Press run quantities are subject to industry standard variations of over/under 10% of the ordered quantities. Choose one of our Release Programs to have your TOMA1 Label shipped to you over a 3, 6 or 12 month period. To Learn more about our Ordering Process, Click here. The minimum order for TOMA1 labels is 100 Rolls. Is this TOMA label for a specific Department? If so please specify. Max file size: 2MB. You can upload multiple files.